Elmer is the young, ambitious king of the Kingdom of Grubmil. Despite being born as a prince, his youth wasn't easy. Ever since he was just a kid, he was very much aware of the fact that he was heir to the throne of Grubmil, one of the strongest and greatest kingdoms in the world. All that he cared about was preparing for the day that he would have to succeed his father. Little did he know then that this day would come much sooner than anyone expected. Tragically, Elmer witnessed his parents being assassinated in front of him when he was still a child of ten years old. For a few years, the kingdom was left in the hands of regents, and when Elmer turned sixteen, he was formally crowned. From the outset of his reign, Elmer tried very hard to follow in his father's footsteps. His father, King Elrick, was a great ruler, who took a lot of measures to increase Grubmil's strength and prosperity. One of the first actions the new king took was to lower the minimum age to be drafted into army to fifteen, increasing the size of Grubmil's army. Because he believes younger people are more loyal to their leader and more dedicated to fight for a cause, the majority of the commanders in his army are also still in their teens or twenties. The chief example of this is General Gareth, supreme commander of the entire Grubmillian army, who is only seventeen years old. Another key aspect of Elmer's life is the special bond he has with his sister, Princess Milou. Both of them were orphanaged at a very young age, so they came to rely a lot on eachother emotionally. Milou's well being is even more important to Elmer than the fate of the kingdom. In short, Elmer carries a very heavy burden - on the one hand he has to rule and expand a great nation, and on the other hand he feels responsible to shield his sister from harm. To live up to these expectations, Elmer is willing to go to extreme lengths. 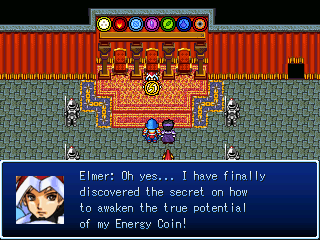 This became apparent when Elmer decided to declare war on the Queendom of Lendarra to steal their Energy Coin, a tool which he deemed necessary in his quest to become the most powerful man alive. Elmer's class, that of the swordmaster, is one of the strongest classes in the game. His strength growth is superb, and his health, defense and speed growth are above average as well. His armour selection is also great: he can equip all the best pieces of equipment, with the exception of shields since he carries a two-handed weapon. 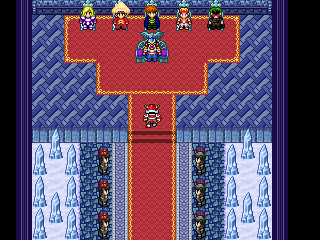 From his father, the late King Elrick, Elmer received a magic greatsword which is called "The Crimson". The Crimson is unique in that it can be enchanted with an element of your choice. This enchantment will stay active until you remove it, replace it with another enchantment, or until the battle ends. This means that even though Elmer (like most physically oriented fighters) cannot use any magic, he can inflict elemental damage at will - and thus fully take advantage of his opponent's weakness(es). Elmer can actually do elemental damage for a much lower mana cost than other mages, because you only need to cast the enchantment once! 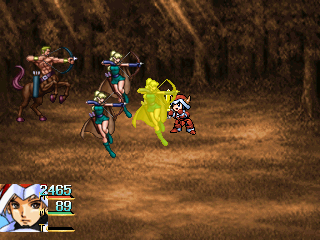 The downside however is that casting an enchantment (also known as a saber) will effectively waste one turn. By default, Elmer will learn a Fire Saber, an Ice Saber, a Thunder Saber, a Poison Saber, a Water Saber, an Earth Saber, a Wind Saber, a Time Saber, a Holy Saber and a Dark Saber, but if you search hard enough you might also acquire the secret Ghost Saber, Snow Saber and Magma Saber.